Gardening gifts for Christmas bring joy to the plant lover during this holiday season. Giving presents is a wonderful tradition and great way to show your thoughtfulness. There are many great Christmas gifts for the gardener to enjoy. Many are inexpensive and some can be homemade. You can give a flowering potted plant to brighten your interior. 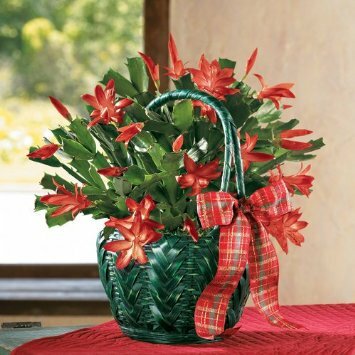 The Christmas Cactus is a very appropriate holiday plant. It has all of the festive colors of red, white and green for this special season. Winter-flowering cyclamen and gerbera daisies are available in a variety of vibrant colors to add cheeriness to your home. They can be used for a centerpiece for your holiday dining table. Go for the low-maintenance, hardy houseplants that will be around long after after the holidays are over. Some good choices include the cast iron plant, which is practically kill-proof, the Chinese evergreen and the snake plant. They are plants which can take low light and dry air, in addition to being indoor air cleaners. A gardening gift basket or a pretty decorative pot (or a watering-can) filled with a small bag of potting mix, a packet of seeds, some gloves and a small trowel will make a delightful gardening gift for Christmas. This is something you can assemble yourself-- a nice homemade gift! If you prefer to get a ready-made kit, Apollo Precision Tools DT3790P 7-Piece Garden Kit, Pink is the one to get. It will be a two-fold expression of your kindness because a portion of the sale goes to help with breast cancer research. 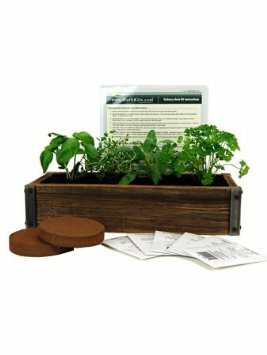 You can Grow Cooking Herbs from Seed: Basil, Dill, Thyme, Parsley, Oregano, Cilantro. You can have fresh herbs in the windowsill in the wintertime. Whether gardening inside or outside, a good, quality pair ofgloves is always appreciated. These gloves are well-fitting, keep dirt and water out, as well as protective from the pricks of thorns, spines, and from the toxins that come from chemicals and pesticides. Gardening Books with pictures and illustrations are a wonderful source of inspiration and information. It is always very helpful to have the different aspects of gardening indoors and out from soil preparation, to plant selection, to insect and pest control included. A book about different plant species and plant care will always be helpful for years to come. There are many small,decorative greenhouses that can be kept indoors. They are ideal for miniature sized humidity-loving plants when the home is hot and dry-- keeps them from drying on the ends and dropping leaves. Place it on your garden table with your other plants to add interest as a conversation piece. A very meaningful gardening gift for Christmas is a greenhouse--just right for the plant lover. This will be good for you to grow your indoor kitchen herbs. Plus, you can start seedlings in the house before transplanting them outside for spring. Poinsettias make the perfect gardening gifts for Christmas. This colorful, festive flower offers something unique and perfect for the holiday season -- the most wonderful time of the year.